Hey everybody, the Storming Jericho crew is back with an update and some thoughts we wanted to share. Linds and I continue to get acclimated to the realities of “normal life”—or everybody else’s definition of a normal life, at least—which has presented both some unique challenges and some awesome opportunities. A few of those opportunities include getting involved in a church with consistency and regularity, having a car we can take to the grocery store, and getting to shower on a daily basis. You’d be surprised at how good a shower can feel when the memories of multiple days without showers still linger in your mind. But for as nice as it is to have those things again, there are also some harsher realities we’ve come back to in this “normal” world we’ve reintroduced ourselves to. One of those harsher realities is the challenge we’re facing as Christians with a desire to be bold for Christ. Our entire goal with our walk across America was to teach ourselves to trust and rely on God for provision while also spreading God’s word and sharing with others the incredible ways God took care of us on our journey. Throughout our walk we felt like we were able to do that successfully (at least by our standards of success). We were blessed with opportunities to share with church congregations, youth groups, families, and random individuals we met along the way. But now we’re back in normal life, where it almost feels natural to scale back boldness and try to “fit in” to the world around us. We see things on Facebook criticizing and condemning Christianity, and it’s harder to speak up. We meet people we disagree with, but, for the sake of “normalcy,” we reserve our words of opposition. We don’t want to “cause a scene” or stir up trouble. But the truth is, Jesus stirred up trouble. He stirred up trouble because he believed what his Father (God) had taught him. Jesus wasn’t afraid to cause a scene. And I’m not just referring to the turning of the tables in the temple. Jesus caused a scene when he criticized the Pharisees in public for twisting God’s laws for their personal benefit. He caused a scene when he defended the woman at the well. He caused a scene when he had every ability to save himself from crucifixion with just a few simple words but chose instead to die for our sins. So why are we so afraid to cause a scene ourselves? As Jesus says in Matthew 10:34, “Do not think that I came to bring peace on earth. I did not come to bring peace, but a sword” (New King James Version). If Jesus wasn’t afraid to bring a sword, why are we so afraid to even bring words of disagreement to a discussion that belittles or condemns our faith? I personally feel like one reason we don’t stand up for ourselves is because many of us don’t know how. Many Christians grow up hearing the important stories (Noah and the ark, David and Goliath, the Christmas story, etc. ), but are never taught how to defend our faith when it’s attacked. In a world increasingly indifferent to Christian truth, followers of Christ need to be equipped to communicate with those who do not speak their language or accept their source of authority. Gregory Koukl demonstrates how to get in the driver’s seat, keeping any conversation moving with thoughtful, artful diplomacy. You’ll learn how to maneuver comfortably and graciously through the minefields, stop challengers in their tracks, turn the tables and—most importantly—get people thinking about Jesus. Soon, your conversations will look more like diplomacy than D-Day. Drawing on extensive experience defending Christianity in the public square, Koukl shows you how to: – Initiate conversations effortlessly – Present the truth clearly, cleverly, and persuasively – Graciously and effectively expose faulty thinking – Skillfully manage the details of dialogue – Maintain an engaging, disarming style even under attack. 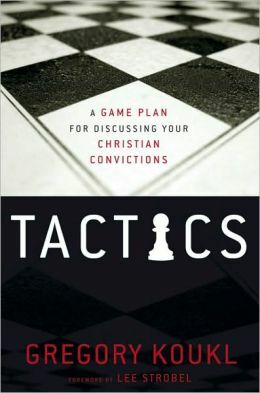 Tactics provides the game plan for communicating the compelling truth about Christianity with confidence and grace. Jesus tells us plainly and clearly that things won’t get any easier for us. They’re most likely going to get harder in the future. That’s why it’s so imperative that we not only have a firmly-rooted foundation in our beliefs, but that we also have the knowledge and tools to defend our faith. Jesus knew we’d face challenges after his death, resurrection, and ascension to Heaven. We’re called not to shy away from those challenges, but to stand up to those challenges and defend our faith. So if you are the kind of person who feels more and more compelled to stand up for your beliefs and defend them in the face of adversity, Tactics provides an easy-to-follow game plan that gives you the foundation to achieve that goal. Of course, there will always be more to learn, but Tactics is a great start, so Lindsie and I both recommend it highly. Thanks for reading, everyone. We’ll try to keep posts like this coming in the future. We’re also excited to share that we’ve begun writing the book chronicling our journey across America, the amazing miracles we experienced, and the incredible lessons we learned. We’ll have more info on that as we get closer to finishing it. For now, we encourage you to check out Tactics (or any other works from Greg Koukl and his staff at Stand To Reason). God bless, and we’ll be back with more soon. Glad to see that your getting settled in. I hope to be doing my walk in May, but might have to change it. Will keep you posted. Happy Birthday to Jesus!Happy Easter from the Storming Jericho crew! Happy Easter from the Storming Jericho crew! We don't just limit our news and updates to the blog. You can also follow along on Facebook, Twitter, and more. Just click the links below and connect with us wherever it's best for you. We live to serve. People have asked if they can support our cause, so we created this donate button. Please know that Storming Jericho is NOT a tax-exempt non-profit, but we appreciate your support nonetheless. On a side note, we're also actively accepting prayers. Thank you. © 2019 Storming Jericho. Smoothly running on the WordPress engine.